After a long wait, finally, the BBC has launched their much awaited BBC iPlayer app for the small screen versions. BBC has always been the big fish target for gearing up with the news and radio broadcasting services. The BBC has made their association with people through website for many years, their app was also available for download through android and is for quite a long time. But, they seemed to join the windows party in a bit delayed time. Though, promised to launch their live streaming app for windows in March 2013, but finally launched it on May 15, 2013. If compared with the BBC iPlayer app for Apple and Android then there is a marginal difference in its feature. Although the app took time to be launched but it is quite out of the box and has all the latest news and radio features on the go. Here you will get additional support for playing the radio either in the background or if you wish in the live tiles. It has the feature of streaming TV shows through the facilities of Wi-Fi and 3G. The app is restricted to only windows 8 users- The BBC iPlayer app for windows can function properly only in windows 8 configured mobiles. Though previously promised from the BBC media team that this app will also be available in windows 7.5 %, but later after the launch of the iPlayer app for windows the BBC reported that due to lack in ability and standards this particular app will no longer be launched in windows 7.5. This app is exclusively for UK users- The BBC iPlayer app for radio and television which is launching the other day is exclusively for UK users. If the shock of not being able to download the app for the 7.5 version of windows mobile users was huge then hold on this is a bigger shock. 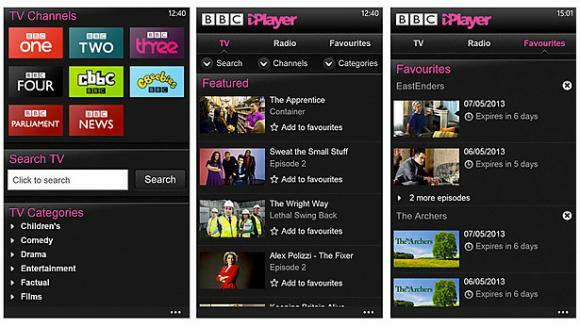 The BBC iPlayer app is a domestic programming app which can be available only and strictly to the users of UK. The live streaming and other television and radio related contents are all featured for UK based users. Though there are some speculations revolving that there is an availability of the iPlayer’s international version, but nothing has been confirmed on that from the BBC media group personnel. Leaving aside all its negativities and lapse of promise keeping, if you are using the BBC iPlayer app in windows 8 mobile phone then you can get the last seven days news stream at your finger tip. So, if you have not downloaded your copy yet, you can shoot out to get the test drive now.